I am home at last, and it is at long last time for me to announce the winners of the Untold Contest. Dear lovely winners, please contact me at sarahreesbrennan@gmail.com, and I promise to send you your copies of Untold IMMEDIATELY. I love the pictures because they tell a story and are hilarious, though this was difficult as I have so many gorgeous readers in improbable places. Special mention to the lovely lady in the throne from Game of Thrones! The team made a whole collection of startling and super fun Unspoken pictures. 3) The winner of the Art Challenge is iceramyst–because of how much this picture incorporates about the characters and the story, as well as the beautiful art. 4) The Surprise Me Challenge was SO HARD and, though I was so wooed and torn by the beauty of the Lynburn dagger rendered in real life and the hopscotch to the Sorry-in-the-Vale song and the piano soundtrack and Kami’s orange bra and the beautiful song Unsaid, I decided to award to Sarsie’s Kami Badge–not just because felting is lots of work I don’t know how to do, but because it is wearable art that I’d love to wear, and so vivid and celebratory of Kami the character. I am also giving an extra prize to bluerose99 – http://www.youtube.com/watch?v=CaiNp584G8c – whose song, pictures and art all together definitely surprised me! I would give out more advance copies, I swear, if I only had them! And a big thank you (and their choice of a signed TEAM HUMAN or a signed DEFY THE DARK) to Allie(the-cat) and Gillian Berry, for their Untold Celebration and snippet art, which has made the countdown to Untold’s release in September so much fun, and to yabooknook, whose tumblr entry made me smile for days. Thank you all SO MUCH for my beautiful, beautiful contest entries, and for your patience in waiting for me to choose. I have been much harried this year (writing two books for next year and another for the year after as well as the Bane Chronicles is a lot, and I do not want to let anybody down! ), but it was also just terribly difficult to choose–friends had to be press-ganged into helping, and love and vanity made me look at the same things over and over. 😉 I feel so privileged to have readers like you, who would take the time and expend the effort. 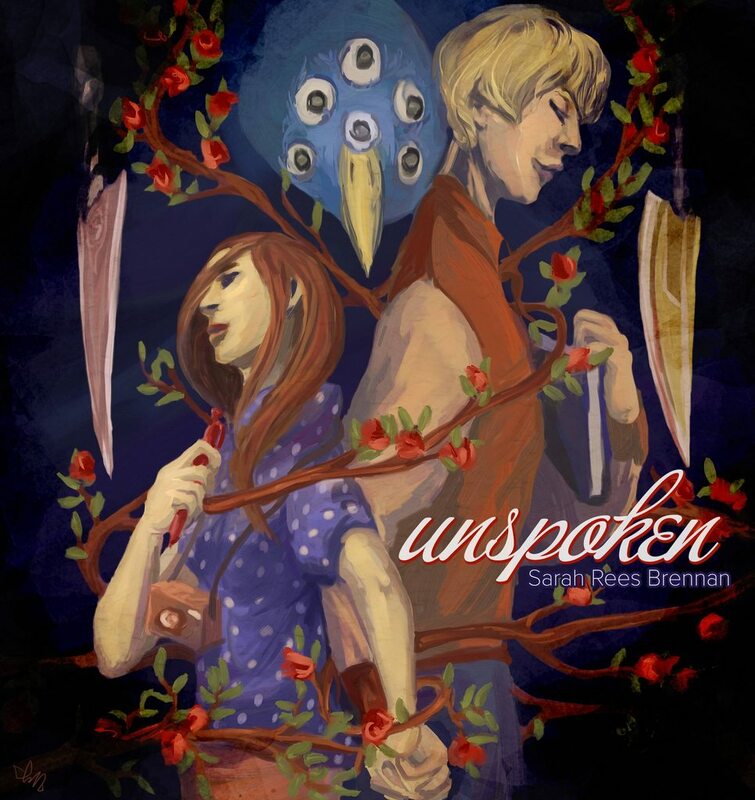 I have tried to tweet and tumblrify this appreciation, but also I thank you all from the bottom of my heart, and this present is for all of you: not a snippet, but chapter one of Untold. Will be more lonely ere it will be less. . . . Welcome to Sorry-in-the-Vale. It’s a Magical Place (and We Mean That Literally). Let’s not front. We all know magic is real. You know. Or it’s time you knew. It’s time someone told you. I always said that every town has a story, that even our sleepy Sorry-in-the-Vale must have one. I was so sure that I could find a story hidden somewhere under the chocolate-box prettiness of our town. I thought finding a story would be like bird-watching in the Vale woods, waiting for bright eyes and a burst of wings. I thought it would be like finding gold. It wasn’t like that at all. I was searching for a story, and then the Lynburn family returned to the manor above our town: the sisters Lillian and Rosalind, their sons Ash and Jared, and Lillian’s husband, Rob. They had been gone seventeen years, but as soon as they returned there was blood in the woods. They were not here long before a girl died. The Lynburns are sorcerers. I have seen magic with my own eyes. I saw Jared Lynburn turn himself invisible. I saw Ash Lynburn make objects fly. I saw shadows come to life, and come for me. It was not Jared or Ash Lynburn who killed someone. Jared Lynburn may be, in this reporter’s completely unbiased opinion, the most infuriating idiot in the land, but he was not responsible for this. Lillian, Jared, Ash, even Rosalind, are not the ones who want to make Sorry-in-the-Vale again what it once was: a place where the magicians were our lords, demanding our blood as their right. Rob Lynburn killed Nicola Prendergast. She was my age: she was seventeen. We were friends when we were children. I do not know how to talk about her death, that she died so a selfish lunatic could have more power, but I know I must talk about it. There are people in this town who already know the secrets of Sorry-in-the-Vale: people who are not talking and not acting because they are afraid. But hiding from the truth will not make it go away. The Lynburns aren’t the only sorcerers. They are the leaders, but there are others. There are police officers who are sorcerers. There are teachers who are sorcerers. There is magic on every side. Rob and Rosalind Lynburn left Aurimere House two weeks ago, and we know Rob was recruiting sorcerers to kill with him months before that. He has not been seen or heard from since he left, but that means nothing. He is a sorcerer and can walk unseen, gathering more sorcerers to him and making his plans. We have to plan too. What can we do to fight magic? What power do we have? Knowledge is power. Knowing this is power: me telling you this is power, for me and for you. Try to be as strong and know as much as you can. The magicians are coming for our town. Let’s be ready for them. Then she checked the time on her computer, saved the document, and made a grab for her bag and her orange jacket with the lace cuffs. It was Halloween, and if Kami didn’t hurry she would be late for the Scarecrow Trials. The sun was setting in crimson slashes and gold ribbons over Sorry-in-the-Vale. Night was falling and Kami had a lot of scarecrows to get through. Kami fell silent. She had roped Angela into much more than the Scarecrow Trials. She was the one who had told Angela that she heard a voice in her head, and that the voice was a real person. She’d drawn Angela into her investigation of the murder and magic in Sorry-in-the-Vale. She had caught the attention of Rob Lynburn, sorcerer and murderer. Kami knew it was due to her that Angela had almost died in the woods two weeks ago. Kami and Angela were on the west edge of town, at the top of the steep slope of Schoolhouse Road. Kami looked down at the old yellow cobblestones shadowed with the coming of night. She traced the line of the road with her eyes, to the sloping roofs and spinning weathervanes of Sorry-in-the-Vale, then to the woods waiting beyond. Kami did not know how to talk to Angela about that, or how to tell her she was sorry. Misery and uncertainty kept flooding through her, tides that had been turned back all her life by a secret voice. Now the voice in her head was silent. Angela, her brilliant dark eyes almost hidden by her veil of black hair, gave Kami a sidelong glance. Angela looked annoyed, which was Angela’s default, but Kami could see a hint of concern lurking underneath. She knew that her new hesitance was freaking Angela out. Sorry-in-the-Vale didn’t have a local paper, and Kami had been proud when she saw people without kids reading the paper she edited, aptly titled The Nosy Parker. At least she was succeeding at something. Kami and Angela stopped at the Greens’ house, one of the few old houses not made of golden Cotswold stone but of granite and slate. It was a gray crumbling edifice that seemed bound together by the dry brown briars of climbing roses growing over it. The Greens’ scarecrow was lopsided on its stand; its yellow gloves, stuffed fat with straw, seemed to wave feebly at them. Kami clicked her tongue. “Poor effort,” she said, taking a picture with her phone and making a note to that effect in her notebook. It was Kami’s turn to give Angela a sidelong look. That was something else they hadn’t talked about. Kami had found out secondhand that Angela had tried to kiss their friend Holly. Kami must have been more or less the worst best friend in the world if Angela had not felt like she could tell her that she liked girls. “We often have special moments where I come into a room and he immediately leaves,” Kami said. “I treasure those times.” She swallowed, the knot in her throat as sharp as if she had swallowed a rose, the thorns raking on their way down. “I don’t want,” Angela told her flatly. “Thank you for that amazing journalistic insight,” Angela responded, very dryly, and Kami felt a little better. Cooper Lane turned out to have an eclectic mix of scarecrows, from the traditional cloth and straw to the experimental: there was one scarecrow with a balloon for a head, and one made of papier-mâché. Kami liked the scarecrow in the pink flowered hat at the Wrights’ because there were so many scarecrows who were clearly guys. Kami felt ladies should represent in the scarecrow movement. “A papier-mâché scarecrow is cheating,” Kami observed judiciously as they passed through the town square at the end of the High Street, heading toward Shadowchurch Lane. “And the cardboard cutout scarecrow was just sad. Enough to make a true scarecrow connoisseur weep.” She was mostly talking to distract Angela from the group of guys standing at the foot of the statue of long-ago town hero Matthew Cooper. In the middle of the little crowd, Kami glimpsed Holly’s golden curls. Kami quickened her pace, and they soon arrived at the church and Shadowchurch Lane. It was almost twilight, the sun a bloody smear on the horizon, the pale blues and greens of the sky fading into gray and indigo. Across from the stone horseshoe- shaped archway of the church entrance was the Thompsons’ house. Their garden was fenced, unlike most gardens in Sorry-in-the-Vale, the black iron bars making a shadowy cage of their front lawn. The scarecrow who stood in that cage wore a black suit. The sack that was its face had been whitened with chalk, and it glowed in the darkness. “Undertaker scarecrow,” was Kami’s verdict. Her voice came out less assured than she wanted it to. The next house belonged to Sergeant Kenn, the police officer Kami had talked to after Nicola Prendergast was murdered. The same police officer she had seen coming to help Rob Lynburn the day Rob tried to kill Angela. Kami slipped her hand into the crook of Angela’s elbow and held on. Since the Kenns’ house was beside the church, the church spire cast a black triangle on the ghost-gray grass. The scarecrow on their front lawn was slumped on its wooden frame, its black-hatted head hanging. Something about the way it was slumped, the fact the body was a little too realistically proportioned, made a chill crawl down Kami’s spine. It reminded her of someone dead. But she was being ridiculous. She was imagining things because of whose house this was. She could see the straw sticking out of the scarecrow’s cuffs. Keeping hold of Angela and drawing her along, Kami set one foot in the dark wet grass and stooped down, peering to see the scarecrow’s face. In the shadow of its hat, the scarecrow’s eyes shone, not with the glint of metal, but with the wet gleam of something alive. Kami’s fingers clamped down on Angela’s arm. There was a flicker of darkness, the gleam of the scarecrow’s eyes vanishing for a moment, and Kami realized what had happened. The scarecrow began to move, sliding its stiff arms off the wooden frame where it rested. Kami watched with paralyzed fascination as it stretched out a leg and took a step toward them. Kami looked and saw that every garden on Shadowchurch Lane was stirring into life. The undertaker scarecrow in the Thompsons’ garden was already off its wooden frame and climbing its fence, round pale face shining like a small horrible moon, coming through the darkness at them. The air was filled with the whisper-like rustle of straw. Behind them, Kami heard screams and the sound of people running. She let go of Angela’s arm and grabbed hold of a branch from the Kenns’ yew tree. The bark rasped cold and harsh against her palms, and Kami wrenched at it as hard as she could until it snapped off in her hands. Angela walked, empty-handed, across Shadowchurch Lane to meet the Thompsons’ scarecrow. She kicked it in the stomach. That did not wind it, or even make its stride falter. Another scarecrow came tottering down the road, bleeding a trail of straw, making straight for Angela. Kami ran out into the street wielding her branch. Angela whirled and grabbed one of the Thompson scarecrow’s arms. It ripped its own arm off and launched itself at her, so light it seemed like it was flying. Angela launched herself right back, no finesse or any of the self-defense moves Rusty had taught them now, just fury and clawing, as if Angela planned to shred it to pieces with her bare hands. The new scarecrow Kami was keeping at bay with her branch was getting braver, its sackcloth feet shuffling in the mess of straw it was bleeding, feinting first one way and then another. It had a turnip for a head, which was wagging obscenely at her as it lunged. Kami stared into the dark hollows of its eyes and got an idea. She stepped forward, advancing even though every muscle in her body was urging her to cringe away, and jabbed her branch as hard as she could into its grinning face. The face shattered, turning into vegetable pulp as she hit it again and again. The scarecrow’s hands touched her, rubber gloves filled with crackling straw fumbling at and catching her throat. Kami forced back a scream and struck until the turnip fell off and the scarecrow tumbled down in an inert heap of straw and cloth. Kami whipped around still clutching her branch, with a cry on her lips for Angela. But Angela had seen what to do already. She was crouched on the road, ripping at the creature’s neck until the sackcloth gave way with a horrible tearing sound, and Angela rose to her feet with its chalk-whitened head in her fist like a trophy. Her eyes met Kami’s and she dropped the head. Kami reached out with her free hand to grab Angela’s. It was only when she found Angela’s palm clammy, and Angela held her hand back hard, that she knew Angela was scared too. Then she heard a choked-off scream, and both their heads turned. Kami thought of the screams and running she’d heard behind them. In the square. She should have known Holly wouldn’t run anywhere but to them. Holly was still in the square, still in a crowd, but the boys were gone and the crowd she stood in now was a jostling, rushing crowd of scarecrows. Kami saw Holly’s bright crown of hair disappear among them, swallowed up. Angela’s immediate race forward was checked by the scarecrow from the Kenn house lunging in front of her. Kami ducked down and scythed its feet out from under it with her branch. At least, that was the idea, but instead the scarecrow’s straw legs sagged forward, bowing instead of falling. This still gave Angela plenty of time to dodge around it. Angela hesitated for an instant, then nodded and ran, her black hair streaming behind her. Kami had told her to go. She had not expected to feel quite so abandoned and alone, the only human left in a street full of horrors. The light from the Kenns’ windows gleamed in their scarecrow’s eyes, and Kami saw they were marbles that had transformed into something that glistened as if they were made of the same stuff as human eyes but stayed small, swirling colors at their center. It had a plaster face that had turned waxy and a little flexible. Kami saw its mouth move infinitesimally, grin stretching. It flexed hands in black gloves, and Kami heard tiny wooden pieces click inside the leather. Rob Lynburn and his sorcerers had made all these creatures come to some semblance of life. Kami had known as much already. But this scarecrow was specifically designed to last longer, to be more capable of hurting her. It was horrible that there was a light on in the Kenns’ house. She wondered how many people were awake in the houses along this lane, knowing nothing or hiding in fear, or standing at the windows watching the chaos they had created. A hand touched the back of Kami’s neck, so terribly light, like a glove filled with nothing but air. Kami spun, trying to keep both scarecrows in her line of sight and jabbing her branch at the new one. It was the scarecrow in the pink sunhat. Kami felt a little betrayed. She hit it and the branch caught on the ruffled material of the scarecrow’s dress. Kami stabbed the branch in deeper and then yanked it out, ripping the scarecrow in two pieces. The Kenns’ scarecrow grabbed at her arm, its grasp firmer than the other scarecrow’s, feeling slick and strangling-strong on the bare skin of Kami’s wrist. Kami wrenched away and saw that there were other scarecrows very close now. One with a little whittled wooden face, its nose a knot in bark, was suddenly at the Kenns’ scarecrow’s side like a henchman. A couple of houses down, there was a dark shape lying splayed in the grass. Kami felt her stomach turn, cold and sick, as she realized it was a scarecrow so badly made it could not stand. It was crawling to get her, on its belly like a snake. Kami dived for the scarecrow with the wooden face. The Kenns’ scarecrow crashed into her, heavier than a scarecrow should have been, as if it had a wooden skeleton buried underneath its straw, and caught her off-balance. Kami fell heavily onto her side, elbow catching the edge of the pavement. The Kenn scarecrow’s leather shoe slammed down toward her face. Kami rolled to avoid it, and ended up flat on her back in the wet grass of the Kenns’ garden. The scarecrow’s waxy face and living marble eyes glistened above her, impassive and terrible, and Kami lifted her branch in both hands to ward it off. In the black shadow of the church spire, light was born. First an orange glint ran along the dark wood of her branch; then Kami caught the sharp smell of smoke and heard a crackle nothing like the sound of straw. Kami kept tight hold of her branch as light raced along it, sparking between the forked ends, and watched it burst into burning life. By the sudden light of fire, she saw there was someone with her in Shadowchurch Lane. Jared Lynburn, one of the sorcerers. Rob Lynburn’s nephew, the real boy she had once believed was her imaginary friend. He was standing back, arms crossed over his chest, watching her. His face was mostly shadowed but the stark line of the scar on his face was white as moonlight, firelight catching the sleeping gold in his dark-blond hair and setting twin lights burning in his pale eyes. The boy who used to live in her head. Kami lifted herself on her unhurt elbow and plunged the burning branch into the Kenn scarecrow’s body. Its coat caught alight, and Kami scrambled to her feet as it scrabbled at the branch with its leather gloves. She shoved the branch into its straw breast and watched it burn from the inside out. She was not surprised when she looked for the scarecrow with the wooden face and saw its face already a charred ruin. She was surprised when she looked across the street and Jared was gone, twining shadows and moonlight where he had stood. Firelight burst in the corner of her eye. Kami turned and looked down the street. There he was, a shadow passing through forms bright with burning. Some of the scarecrows writhed as they burned in a ghastly parody of a dance. Jared stopped at the garden where the ill-made scarecrow lay, a humped-up shape in the grass. Kami watched him watch it, weakly rolling in the grass as it burned, and thought she saw him smile. She could have followed him. He would not exactly have been hard to track, what with his blazing path of destruction and all. But Jared obviously did not need her help. Angela and Holly might. Kami turned away from him and ran, clutching her burning branch, down to the town square. Angela was standing beside the statue of Matthew Cooper. Holly was sitting at the base of the statue, short skirt riding up her purple tights as she put her boots back on. Beside her boots was a metal sign from one of the High Street shop fronts. Standing diffidently on the other side of the statue was Ash Lynburn, Jared’s cousin and Rob’s son, his camera around his neck and piles of cloth and straw all around him. “How’d you do that?” Kami asked. It was the first thing she had said to him in two weeks, since the day she found out his father had persuaded him to spy on her, and almost persuaded him to kill Angela. “I’m badass like that,” Kami said, putting the branch down on the cobblestones. It was still burning. She had no idea how to put it out. “I saw him,” Kami told him shortly. She jerked her head toward the road past the church, and the burning trail Jared had left. She went to sit at the foot of the statue beside Holly. Holly linked arms with her. Kami leaned in close, sharing warmth as they looked around the nighttime square and past it to the rest of their town where there were still fires burning and straw men moving through the dark. They had known it was coming: Rob Lynburn’s first move to terrify the town into submission, to make it a place where sorcerers ruled again, where they could kill for power and nobody would stop them. They didn’t know who most of Rob Lynburn’s followers were, but some people who didn’t follow him must have seen what was happening. Nobody had come to help. Kami shivered in the night air, and felt Holly shiver too. When they saw someone walking toward them down the High Street, they both jumped. Angela ran past them both, and when she reached her brother she punched him in the shoulder. Rusty’s shirt was torn: he put an arm around his sister, and looked at Kami over Angela’s head. His often-sleepy hazel eyes were bright and intent. “You’d better tell me,” Rusty said. Kami looked around the square at the remains of scarecrows in the moonlight. “We’d better go to your house first,” she said. “It’s not safe here.” She didn’t know if anywhere was safe. She didn’t want to go home, so there was nowhere to go but Rusty and Angela’s place. She wasn’t welcome at the Lynburns’. Kami lifted her eyes to Aurimere House, which stood outlined against the sky. Its windows reflected the lights of fires burning all over her town. AHH! I won a thing even though I didn’t win THE thing! Thank you, thank you! I’ve been dying for a copy of DEFY THE DARK. You’re so kind to your victims… er, fans. So we just email you our mailing addresses if we won things? Do I need to prove my identity? I am me. I hope that is proof enough. I remember squealing and gasping all the way through this first chapter when you were so kind to give it to me when you were in LA with Cassie. It’s just as splendidly creepy and funny as I remembered 🙂 Untold release day can’t come soon enough! I can’t even. You are the amazing-est. This is amazing! I can’t wait for the release! I love you dearly. I have been grinning at my computer screen for the past 5 minutes and now I can’t seem to stop. Now I’m go go torture myself with Ch. 1, yes. A fine plan. Send it through email, m’dear! Hi 🙂 Don’t see a winner picked for the Defy the Dark + Untold ARC contest? Did you pick one yet and I missed it? 🙂 Either way, thank you for being awesome! Thank you for sharing, but I don’t think it was caring. First, I am now terrified of scarecrows. Thanks for that. Second, there’s no way I’m going to be able to wait for the full book! Augh! I tried to post this over on livejournal twice but I keep getting failure notices for some reason, O_o? Anyway, just wanted to say thank you so much again, Sarah! 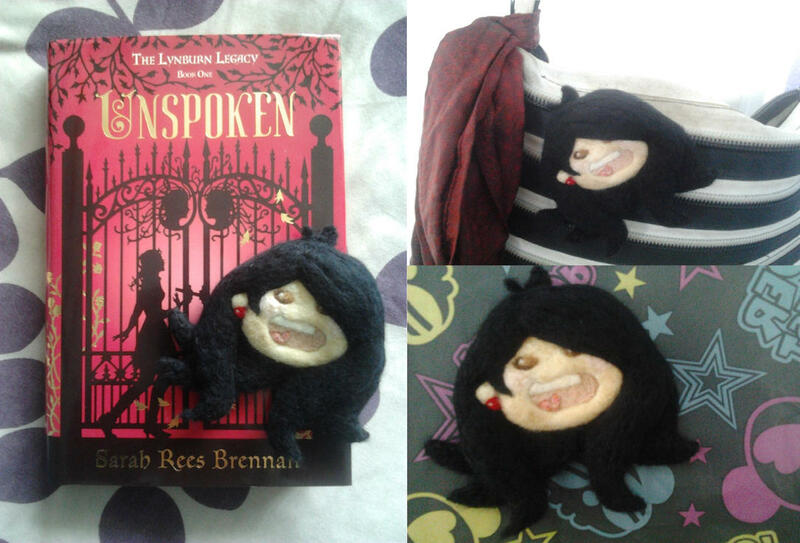 Got my prize on Friday, and Unspoken is super amazeballs!!! Can’t wait ’till it’s released and I can talk to everyone about it! !! I thought Jared wasn’t in it and I almost got disappointed. Now I can’t wait!! The Kindle edition on Amazon says (or says, it may not now) that it was going to be released on August 29th… I don’t know what that’s about, but if I can get it earlier, who am I to question?! So excited. Well, whenever it comes out, I super hope you like it!